Black In America = Black In Brazil? What do Black Brazilians and Black Americans have in common? 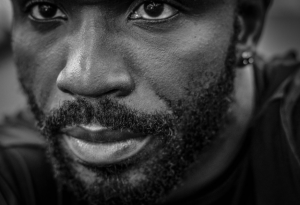 Black people in Brazil have a similar story to Blacks in America – with slight differences. 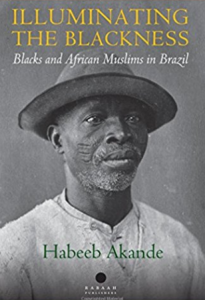 So when author Habeeb Akande sent me a fresh copy of his latest book, Illuminating The Blackness: Blacks & African Muslims In Brazil – I was curious and ecstatic to read it. This book shows you just how Black, Brazil really is. Most people know nothing about the huge black population in Brazil. You may hear comments like “Oh they aren’t Black, they are Latinos” or “Well, they aren’t really Black right?”. In Akande’s new book, you’ll discover a powerful and interesting history about Blacks in Brazil. Like Habeeb, I’ve spent significant time over the years connecting with Black Brazilians. Volunteered at a Black English school. I actively pursue building relationships with Black Brazilians because it’s important to me to connect with people from other countries and cultures. A quote in Illuminating The Blackness explains it clearly. Habeeb explains how every black experience – whether it was in the Americas, Europe, Asia or even Africa – is similar. During his trips to Brazil, Akande noticed the similarities between Black Cariocas (Black people from Rio de Janeiro) and Yorubas in Nigeria. He also noticed the racial hierarchy in Brazilian society that a few people sweep under the rug. Because of this racism, Black Brazilian history – and African Muslim influence in Brazil – has been downplayed. Later – he visited Salvador and Sao Paulo. During my visit to Salvador, at times I felt as if I was in Nigeria. Some of the Bahian cuisine and a number of the customs are from West Africa. Many Bahians informed me that they were proud negros/negras (black) and are connected to their African history. Many morenos/morenas, (brown/mixed-race) Brazilians who phenotypically were Europeans – or Asian-looking, even spoke fondness of their African roots. Akande decided to write Illuminating The Blackness because the current Brazilian educational system doesn’t teach the history of Black Brazilians and Muslims in Brazil. Illuminating the Blackness presents the history of Brazil’s race relations and African Muslim heritage. The book is divided into two parts. Part I explores the issue of race, anti-black racism, white supremacy, colourism, black beauty and affirmative action in contemporary Brazil. Part II examines the reports of African Muslims’ travels to Brazil before the Portuguese colonisers, the slave revolts in Bahia and the West African Muslim communities in nineteenth century Brazil. 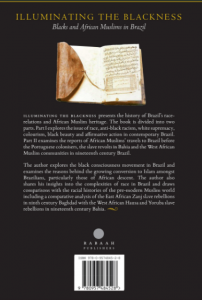 The author explores the black consciousness movement in Brazil and examines the reasons behind the growing conversion to Islam amongst Brazilians, particularly those of African descent. The author also shares his insights into the complexities of race in Brazil and draws comparisons with the racial histories of the pre-modern Muslim world including a comparative analysis of the East African Zanj slave rebellions in ninth century Baghdad with the West African Hausa and Yoruba slave rebellions in nineteenth century Bahia.